Your nerv es make up a system of “wiring” that carries signals between your brain and the rest of your body. Your nerves are constructed similar to electrical wires with a protective insulation covering the information-carrying “core”. A single nerve contains millions of individual fibers which are grouped together in bundles within the nerve’s insulation. The information carried through your nerves depends on their specific function. Motor nerves carry information between your brain and extremities to make your body move, whereas sensory nerves carry messages to the brain to signal pain, hot and cold, and pressure. Your nerves are fairly fragile, and can be damaged by excessive outside pressure, overstretching of the nerve, or a cutting force. Generally, a pressure-related or overstretching of the nerve can cause the fibers within the insulation to break, without harming the insulation itself. On the other hand, when a nerve is cut, both the information-carrying nerve fibers and insulation are broken. Regardless of the type of injury, a broken nerve connection can prevent muscles from functioning properly and cause a loss of feeling in the affected area. When the fibers within the nerve are severed, the end farthest away from the brain dies but leaves the insulation intact. The end of the nerve closest to the brain remains alive and over time, may repair itself by re-growing through the empty insulation. If the nerve fiber and insulation are cut and the problem is not addressed in a timely manner, the growing nerve may form a ball at the break in the insulation called a ‘neuroma’. This ball can cause significant pain and even an electrical sensation when touched. When addressing a cut nerve, the doctor performing the surgery will need to sew the ends of the severed insulation back together. 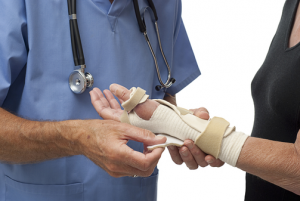 Since nerves are so narrow, the stitches are quite small and fragile and often require a splint to prevent them from stretching while they heal. The goal for this surgery is to give the nerve the ability to grow back through the insulation naturally. In the instance of a crushed or stretched nerve, it may be necessary to graft a small section of nerve from another area of the body if there is a gap in the insulation. If there is no gap, it’s generally a matter of time and allowing the nerve to heal on its own. If the insulation is intact, a nerve can re-grow at the rate of about an inch every month. 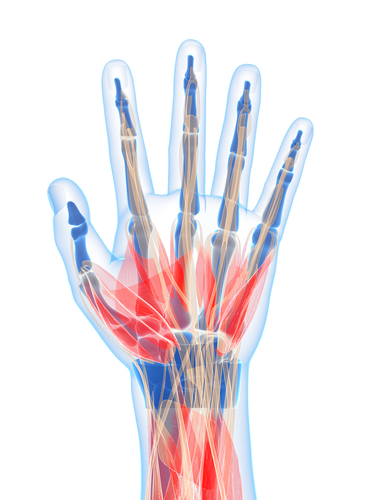 During the waiting period while the nerve is healing, our hand and wrist specialist may recommend therapy to keep your joints flexible in the meantime. In the event that a sensory nerve was damaged, you should be extra cautious not to cut or burn your fingers as you will lack the ability to feel pain. Often, after recovery is complete, some form of sensory re-education is necessary to re-acclimate the brain to working with the newly healed nerve. If you have any questions or would like more information on hand and wrist nerve injuries, request an appointment online or give us a call today at 904-825-0540.